Culture: Strategy Tsunami or Supporter? 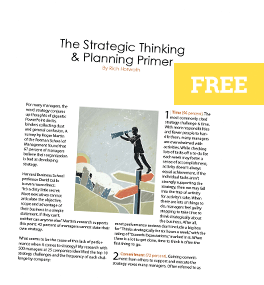 I had a conversation with a fascinating writer named Wayne Hurlbert in which we discussed how to build a strategy that can flourish in good times as well as bad. Wayne made an interesting point that while we often focus on the nuts and bolts of strategy development and execution, we often overlook something that can drive or destroy it all. And that’s culture. Because it gets lumped in with the soft stuff, we often don’t give it much consideration when implementing our strategic plans. What examples have you seen where culture played a prominent role in supporting strategy execution or where it torpedoed strategy execution?